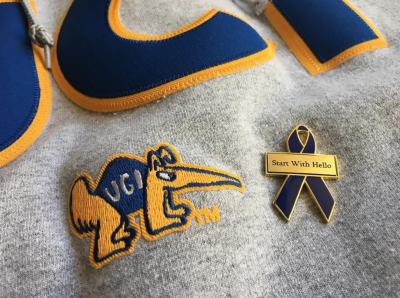 One of the students at UCI sent in a picture of their pin from Start With Hello week, earlier this month, where they invited some local 7th graders to discuss social isolation and it's effects. Many socially isolated students end up suffering from depression, struggle with learning or social development, and sometimes take their pain out on themselves or others. The Start With Hello campaign educates teachers and students on how to prevent social isolation. BECAUSE EVERYONE NEEDS A FRIEND, AND WE SHOULD ALL BE KIND TO OTHERS! And so today, on Stand Up to Bullying Day, it feels appropriate to share the picture they sent us. Isolation and bullying can cause many of the same consequences, so be good to one another. Stand Up to bullies, and be a friend to someone without one.